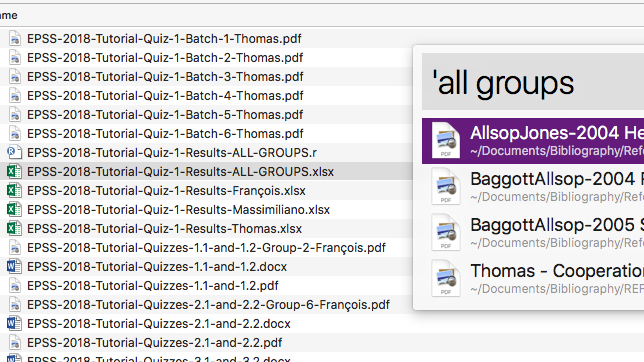 Since I reinstalled Alfred on a 10.13 system, it has not been able to find partial filename matches as it used to -- see attached screenshot for an example. When I first saw the issue, I rebuilt cache and metadata, which seems to have solved at least part of the problem, but only part of it. In particular, it seems that the problem is with filenames of the form words-with-dashes, which are not found when the dashes are omitted and/or when the entire series of words are not typed. If the file is called words-with-dashes, then searching for words dashes won't find it. Searching for words-with will work, though. And strangely enough, searching for words *dashes does work. How can I fix this, please? I have the same issue on 10.11.6 as well. Every other word seperator like dashes or + seems to work fine. Thanks for reporting it too. Not a good sign if the problem exists across OS versions. If an admin stops by this thread, perhaps s/he could rename the thread to append "issue with spaces in filenames." Here are two more examples of this bug, where filenames-with-dashes do not show up in Alfred. Edit: now filed as a bug. Edited October 23, 2018 by Fr. Locking this thread so we don’t have split conversations. Discussion should continue in the linked bug report.